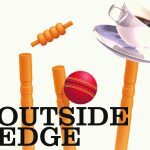 STAG presents our first production for 2019 by Richard Harris, Outside Edge, directed by Robert Harsley at the Strathmore Community Hall from 28 February to 9 March. Roger is having trouble getting a cricket team together for the afternoons fixture against the British Railways Maintenance Division Reading East, but this proves to be the least of anyone’s worries. Bob is having marriage trouble as he is still doing odd jobs for his ex-wife behind his current wife Ginnie’s back. Dennis is also having marital trouble as his wife seems intent on moving house despite the fact they only moved recently. Kevin is trying to fight off his over-affectionate wife Maggie, while at the same time nurse his injured finger and Alex’s new girlfriend ends up shutting herself in the toilets having hysterics. Even Roger’s seemingly perfect marriage to Miriam hits the skids when she discovers he was playing away from home in more ways than one on a trip to Dorking last year. Just when it seems things can’t get any worse for them, disaster strikes..